God’s heart desire from eternity, and apparently the reason He created heaven and earth was to tabernacle, or dwell with His people. God conversed with Adam in the garden until sin came about. Since then, a sinful man can not approach a holy God. As God called Moses from the fire that did not consume the bush on Mt. Sinai, Moses was being trained on the holiness of God. Moses was not to approach God’s presence too closely, and he was to remove his shoes because the ground was holy. The ground was holy because the presence of a holy God was there. Yes, sinful man can not approach a holy God, without a Mediator of the New Covenant. The Tabernacle itself pointed forward to the ultimate sacrifice for sin. 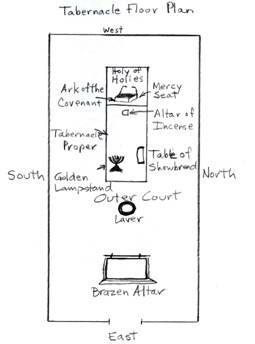 The Tabernacle did not only point forward to His sacrifice, but also to His position of King, Prophet, and Priest. Exodus 25:12 And thou shalt cast four rings of gold for it, and put them in the four corners thereof; and two rings shall be in the one side of it, and two rings in the other side of it. Exodus 25:13 And thou shalt make staves of shittim wood, and overlay them with gold. Exodus 25:14 And thou shalt put the staves into the rings by the sides of the ark, that the ark may be borne with them. Exodus 25:19 And make one cherub on the one end, and the other cherub on the other end: even of the mercy seat shall ye make the cherubims on the two ends thereof.